Throughout the process industries, high speed mixers are commonly used for a number of objectives including powder wet-out and dispersion, solubilization, particle size reduction and homogenization. In particular, rotor/stator style mixers, also called high shear mixers, are considered to be one of the most versatile systems due to their ability to prepare fine emulsions as well. Available in batch and inline configurations, these mixers are comprised of a rotor that turns at high speed within a stationary stator. As the blades rotate, materials are continuously drawn into one end of the mixing head and expelled at high velocity through the openings of the stator. 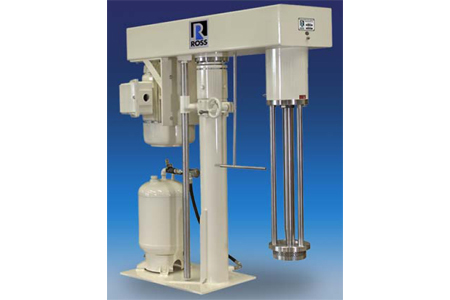 The resulting hydraulic shear promotes fast mixing, disintegrates solid agglomerates and accelerates emulsification. The main drawback of rotor/stator mixers is insufficient product turnover at elevated viscosities. As the batch material approaches 20,000cP, a conventional rotor/stator system may start to exhibit poor product flow within the vessel, often resulting in localized heating of materials near the high shear zone. In addition, the mixing intensity generated by this type of device is sometimes not adequate for producing extremely fine particle or droplet size distributions.